A recent survey found that 66% of workers in the US struggle with finding the right work/life balance – and they aren’t all parents. With our 24/7 culture, even employees without children find it challenging to keep work and home priorities in reasonable proportions. The real issue isn’t the continual balancing act between work and home; rather, it is the fact you don’t know what the balance is all about. When you are clear about what’s important to you, choices are easier to make, and you are more content with your decisions. In contrast, when you aren’t clear and find yourself struggling with decisions about where to spend your time and energy, your feelings of stress and guilt go up and your energy plummets. To get back more energy and to counter the stress and guilt of where to focus, re-frame the idea finding “work/life balance” by harmonizing your personal identity and purpose with your current employment. How Compatible is Your Personal Vision /Mission with Work? Start with creating a big picture vision for how you want your life to be. Your vision includes what you want to experience and/or contribute throughout your lifetime. Your corresponding mission goes into more detail about what you want to do to make your vision come true as you use your talents and gifts. Once you have a broad personal vision and mission, notice how compatible they are with those of your chosen career and current employer. For example, if your vision is to create a world where you help others express themselves uniquely, using your ability to empathize with others, see how that dovetails with your career. I’ll assume it is possible to fulfill you vision and mission in all careers, while it’s easier to do so in some versus others. The more you can live your own vision and mission through your career, the less you’ll struggle with work/life balance and the more you’ll be in flow. Also, compare your personal vision and mission with those of your company. They don’t have to match up 100%. However, the less overlap, the more likely you’ll experience the dissonance between them, causing those feelings of overwhelm and lack of balance. If the disconnect is great, you may want to consider finding an employer that is more in line with your personal vision and mission. How About Your Personal Values? As with your vision and mission, work and home harmony is easier the more your personal values are in line with your employer’s values. To assess this, determine your top 3 personal values — the conceptual principles that are critically important to you and by which you act and make decisions. Seek commonality or connection between your personal values and those touted and lived by your company. For example, if one of your core values is “honesty” and you work for a company that is deceptive with customer and employees, then you might routinely feel conflicted at work – even if that company purports to value “honesty” or “integrity”. In contrast, if the company goes the extra mile to be honest and keep its promises with customers and employees, you’ll experience more harmony and flow. Again, you don’t need 100% alignment between your core values and those of your employer. Yet, the more synergy there is between them, the less tension, overwhelm, and guilt you’ll have about spending extra time at work or taking time off for personal priorities. Based on your vision, mission, and values, you probably have set some aspirations for yourself, personally and professionally. Compare these personal and career goals/aspirations with the goals you are currently charged with at work. Is there a way to further your personal goals through your work goals? Often, work goals give you opportunities to receive training and make connections that are beneficial personally. In turn, focusing on the relevant projects and tasks that further your work goals can also harmonize your schedule between work and home. When you intentionally schedule the work tasks that further company goals, you may realize you’ve been caught up in a lot of “busy” work that has sapped your time and energy, leaving you with the stress and guilt of not attending to things at home. That’s why it’s important to align your personal and work priorities. Doing so, can clarify the personal and work choices presented to you. When your career and current employment fit within your personal vision, mission, values, goals, and priorities, the balance or harmony between them is greater. WANT TO USE THIS ARTICLE IN YOUR NEWSLETTER, BLOG OR WEBSITE? You can, as long as you include this information with it: Beth Strathman works with women in leadership who want to have more positive impact within their organizations, by gaining greater composure, focus, and influence with their teams. 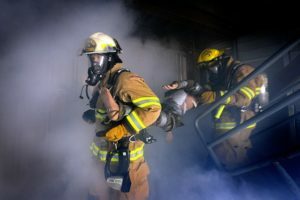 Learn more at: firebrandconsultingllc.com. You’ve heard of the “freshman 15” referring to the 15 pounds college freshmen tend to gain during their first year away from home? Well, it seems there’s a related phenomenon called the “Startup 15”. This is where entrepreneurs tend to gain weight as they begin their businesses because, with their unrelenting focus on their businesses and the stress that goes with it, their exercise and eating habits become less consistent and generally less healthy. In short, they don’t take time for themselves. If you’re an entrepreneur or new to a leadership position, in all likelihood, your focus on work leads you to neglect aspects of self-care like eating right, exercising, and relieving stress in general. Yes, you can run on adrenaline for awhile, but at some point the stress will catch up to you. Building little bits of self-care into your daily or weekly routine is important and do-able. 1. Set an alarm on your phone for meals and snacks. How many times have you “forgotten” to eat? It happens, but it’s not good for your blood sugar. Setting an alarm 5 times a day will help you eat small amounts more frequently throughout the day, keeping your blood sugar more even. 2. Aim for 50% fruits and vegetables at each meal or snack. I hear kale or seaweed chips are tasty. It might be worth a try to get more greens into your diet. Then, exhale for 5 counts, pushing all the air out. Do this 5-5-5 breathing 5 times in a row, and do this 5 times throughout the day. It’s amazing how it can calm you down or refocus you, especially if you do it when you find yourself feeling tense. This type of breathing also helps balance your heartbeat. 4. Touch your lips with one or two fingers to calm down. Sounds silly but it works. Nerve fibers connected to your parasympathetic nervous system are located in your lips. In doing so, you calm yourself and de-stress. 5. Schedule an exercise appointment with yourself. You probably schedule time to meet with others, so schedule time with yourself. Whether it’s a walk around your neighborhood or time at the gym, schedule it. You’ll be more likely to follow through with it when you commit it to your calendar. WANT TO USE THIS ARTICLE IN YOUR NEWSLETTER, BLOG OR WEBSITE? You can, as long as you include this information with it: Beth Strathman works with leaders who want to confidently become the leader they are meant to be as they maximize the “people side” of business. Learn more about her at: firebrandconsultingllc.com. Sign up for my Conversation Planner and monthly newsletter. Use this tool to plan out how to approach a tough issue with a direct report or colleague respectfully and timely. Opt In. Your information will be used to send you this tool and subscribe to my monthly newsletter. You may unsubscribe at any time. We only send you relevant information and will never sell your information to 3rd parties. Copyright 2019 Firebrand Consulting LLC. All Rights Reserved.